Is Your Boardroom Presentation Ready? So you've got a cool table and some comfortable chairs. That's the foundation for a great boardroom. But is your space presentation ready? To complete your project you'll need to integrate a few key components to ensure your daily collaborating sessions are streamlined and effective. The first thing you'll want to add is a basic power module. We recommend the FlexCharge9 from ESI. 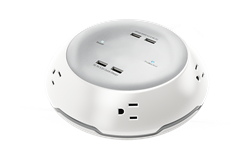 This universal power module with USB inputs can be used with any table you've purchased. If your table has surface level grommets you can route the power cord of the FlexCharge9 easily and cleanly to keep your space looking great. The need to have readily accessible power inputs on your table should not be overlooked. Now that you've powered up your space, it's time to add a cool presentation board. 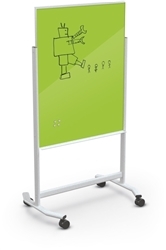 We absolutely love the 74965 Visionary Move magnetic marker board from MooreCo. It's mobile and easy to position where you need, when you need. 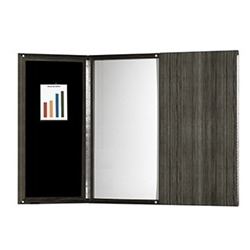 This versatile boardroom accessory can also be used in professional training and classroom environments. You might also consider investing in a dry erase board that can be mounted to a wall in your boardroom. It will come in handy during your creative meetings and won't take up any of your valuable floor space. As an added bonus, many of the best boardroom furniture lines offer presentation boards to match tables and help create fluidity within your interior. Adding a lectern or speaking podium is also a great idea. It will provide a focal point within your space and an area where presenters can sit notes while they teach and deliver important information. If you can't find a wood lectern to match your boardroom table, consider going with a neutral option like the 1050LT from Mayline. This basic black lectern is affordable, versatile, and beneficial. Last but certainly not least, you can't go wrong with a good flat screen. 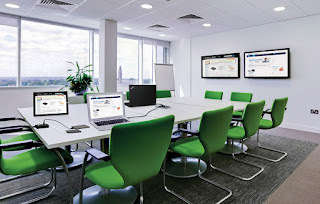 A Smart TV that can be connected to a laptop will help you show power point presentations with ease. If you're tired of wheeling in a squeaky AV cart, fashionable options are available from brands like MooreCo, Mayline, and Global Total Office. That being said, there's nothing wrong with mounting a flat screen on the wall of your boardroom. This ensures it's always in your space where it's needed the most. Flat screen television mounts are widely available at home stores and won't break the bank.